Asphalt — thick, black and pungent — has held our roads together for over 150 years. It forms naturally, is cheap and easy to repair — but come summer, it swelters. Asphalt is so adept at absorbing solar energy — it soaks up 95 percent of sunlight — that the results can be more than just uncomfortable. During a deadly May heatwave an asphalt crosswalk melted in India, forcing people to abandon their shoes, which were stuck in the cooked tar. But there may be a solution to heat-absorbing asphalt — developing lighter pavements that will reflect more sunlight than the traditional, dark ground. 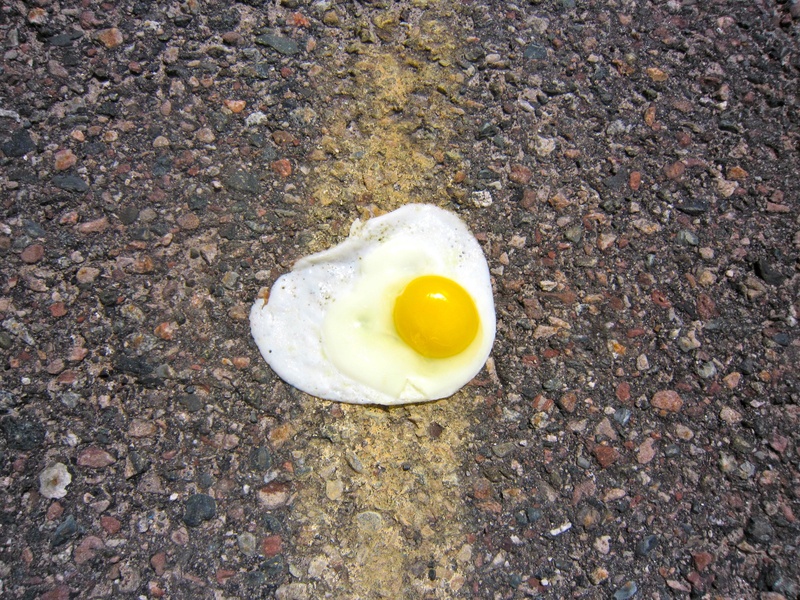 Globally, asphalt pavement is a contributor to the urban heat island effect, which can keep cities as much as five degrees Fahrenheit warmer during the day and a staggering 22 degrees warmer at night, compared to nearby suburban and rural areas. The added heat has many impacts, including increased energy consumption and air pollution as the masses turn on their air conditioners. Driven by concern about human health and our warming climate, the search for alternatives to asphalt is picking up steam. Finding pavements that are as cheap and durable as asphalt, however, has proved difficult. A 2011 experiment at the Lawrence Berkeley National Laboratory illustrates the problem. The lab painted traditional blacktop with colorful coatings, enhanced to reflect solar energy. The coatings were made of a range of materials, including acrylics and lighter-hued paints. The result looked like a giant board game, with red, yellow, blue and green squares painted over large swathes of the ground. The project, called The Cool Pavement Showcase, proved mightily reflective: On a mild, sunny, 72-degree California day, the naked asphalt measured 138 degrees Fahrenheit. The light blue “teal” coating measured just 111 degrees, and the cream-colored “latte” won the race, at 107 degrees. But the cool times were short-lived. The culprit? Traffic. Construction vehicles inadvertently destroyed the colorful showcase, and this revealed an important problem. 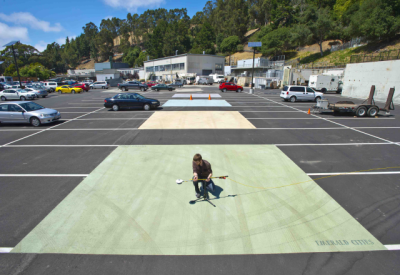 “When considering cool pavement technology, a significant challenge is traffic, because it wears away the top color,” says Ronnen Levinson, a researcher for the Berkeley laboratory’s Heat Island Group. “These coatings need to be made more durable.” A similar circumstance can be found on crosswalks in cities — traffic constantly wears the paint away, and city workers must return to apply fresh coats of paint to the faded lines. Lighter alternatives, like concrete, can lower ambient temperatures in cities. The materials in concrete and the manufacturing involved, however, typically make it more expensive than asphalt — and paving an asphalt road is not cheap in the first place. In 2014, the Florida Department of Transportation estimated that repaving just one mile of a four-lane urban roadway costs the state $2,413,168. The same year, the Arkansas State Highway and Transportation Department estimated that paving a mile of one-lane road in asphalt costs $700,000, while the same stretch paved in concrete would cost $1,000,000. A promising alternative that Shickman believes will “move the fastest” might also be the simplest. Rather than abandoning asphalt — which is an unlikely proposition in many places — Shickman thinks cities can integrate paler crushed rocks into the asphalt pavement. With black tar as a binding agent, this certainly won’t achieve the reflective nature of the Cool Pavement Showcase’s “latte” finish, but it could at least withstand more traffic. Even if lighter pavements did become durable and affordable, it wouldn’t necessarily make a big difference in city temperatures, some experts say. “Reflective pavement doesn’t just reflect this energy out into space,” says Harvey. “It can heat up things around it, like buildings. Reflective pavements are just one factor in a complex system.” The amount of greenery and natural spaces in cities are also influential factors, says Harvey. They absorb less solar heat and shade pavements from the sun, which has a cooling effect.